Both teams could have legitimate grievances. Boro had four penalty shouts. Yes, three of them were probably instinctive primal screams that could be easily waved away by the ref. “You’ve seen them given.” Maybe, but you would be furious if it was given against you. But the handball? That one looked clear cut. And then there were the free-kicks given in defiance of the evidence. Or not given despite it. Or given the wrong way. With the Boro fans howling in derision and injustice in the second half it seemed at times the referee was openly trolling them. But Watford fans had grounds to feel aggrieved too. Antonio Barragan should have been sent off. He was already weighed down by a yellow after a rash touchline challenge on Success when he committed a carbon copy one 10 minutes later and the ref stomped over. The official then did himself no favours as he fanned the flames of the consistency/commonsense debate. If the first was a yellow card then so was the second. There was no question about it. He was off. But after a long spell of reading the riot act with anxious captain George Friend mediating and/or translating the referee took unilateral action that would have had the assessor choking on his Bovril and gave the shaky Spaniard a verbal ‘orange card,’ a final warning. The referee was poor – but he was poor for both sides. It was an even handed show of ineptitude. Corners and throws went the wrong way, players – on both sides – threw themselves to the ground, some ropey advantages were played (or not played) and as the niggles spilled over into a card fest it felt like it wouldn’t take much for the game to flare into open warfare. But Boro had been played. Yes, the referee wasn’t the best as the song had pointed out, but the team had been lured into a tetchy, scrappy, disjointed game that dragged their own mindset off course and guided the match up a cul-de-sac. 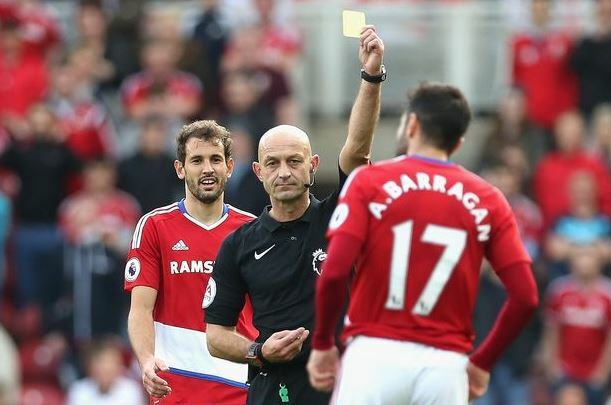 After the game Aitor Karanka criticised Watford’s time wasting and then channelled Jose and hinted at a shroud of dark conspiracy: Boro had been shown more yellow cards than the opposition, maybe as the Premier League new boys they were getting a rough deal but he didn’t want to say what he really thought. But that can’t disguise the truth: Boro were not good enough to win. They had control of the game for half-an-hour but then let it slither out of their grasp and paid the price. They started well. They were playing a crisp, calm and patient passing game, dominating possession and whenever they put the ball in the box a woeful Watford defence fell into disarray. They were awful. Watford were wobbling like a fat Nana on a bike. It was chaos in there. It seemed they were one telling cross away from a collapsing like a Jenga stack and that a fatal mistake or a penalty was imminent. But Boro took their eye off the ball. They were distracted by the niggles. They lost their shape, their way and their discipline and they were punished for it. Again. It was a game there for the taking but Boro somehow gave it away. With another self-inflicted goal. Boro started the second half brightly, had put a few dangerous crosses in and Cristhian Stuani fired just wide. Boro were turning the screw. Then BANG! The weekly mistake. And a familiar formula. A poor attempted clearance from the box (this time Marten de Roon), then a Boro man favourite to collect the loose ball was muscled off the (Stuani again) and then a curling angled effort that took a slight deflection and squirted in under the bar. If you want a stick to beat the keeper, Valdes may have had spotted it earlier, reacted to the clip and got to it. 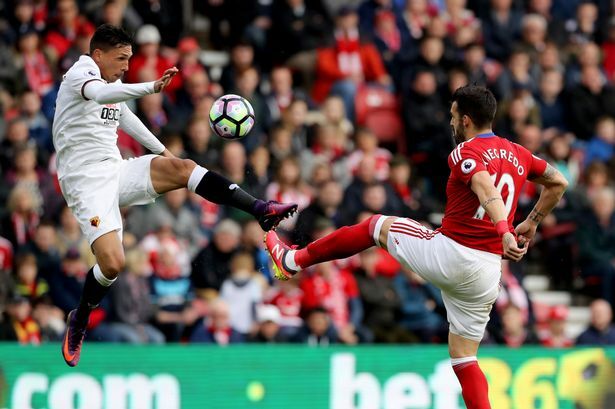 If you want a stick to beat Stuani with he was slow again to react to what should have been a routine collection as he had been again Spurs. If you want a stick to beat de Roon with, his clearance was played down the throat of the Watford attack rather than into row Z. There is a handy bonfire of sticks building up there. For Boro that was a deeply worrying display. It was three points there for the taking and it was a lack of nous and concentration – game management – as much as a lack of a clinical cutting edge that cost them. But it was also a result that will dent their points projections. 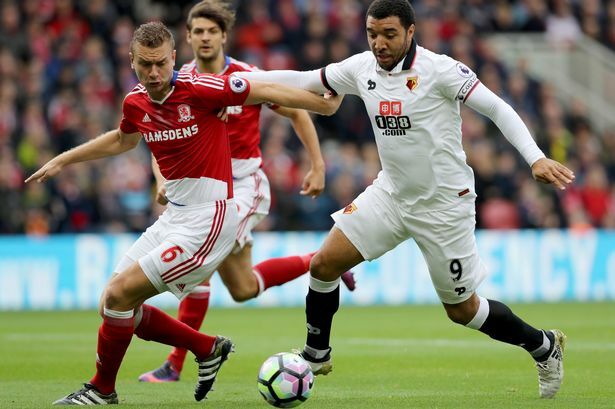 Realistically Boro will see every point gained from the big boys as a bonus but will have budgeted to bank something from the lesser sides – and on the first half showing Watford were as poor a team as we have seen this season. And it is a result that must also dent morale. Boro have not won at home this season and after a solid start have now taken just one point from 15 and are above the drop spots on goal difference alone. And with trips to Arsenal and Manchester City looming it won’t get any easier to get back on their survival curve. And once they are in the hot spots it could be very hard work to get out. Boro will know that was a game they could and should have won. They can’t afford the costly lapses in concentration. They can’t afford any more mistakes. And most importantly of all, they can’t afford to squander winnable games. OPINIONS eh? Here’s my player ratings for the match. I’ve taken some flak,. Apparently I should have used the marks as a punishment beating this week. Yes we are all gutted not to have won a game that was on a plate but – the goal aside – Boro edged possession, created chances (not enough but more than Watford) and should maybe have had a penalty. They fell short but weren’t out-classed or battered. So some perspective. The problem is that the vast majority of them were average when we need to start having days when the vast majority are above average. ….and the lone striker is expected to track back. Relax everyone. You’ve all forgotten the golden rule. Boro tend to lose to teams we’re meant to beat but also tend to win against teams we’re meant to lose to. Simples, we’ll beat Arsenal against all odds and we can work out how it happened afterwards. What I know about football – still playing in the same team I started 22 years ago and discussing with an International coach who used to know Gerald Houlier – is that when the going gets touch, one goes back to the basics. What I try to say, you try to go back to the basics and simplify thing. Go to the basics and make that work. In my opinion now is not the correct time to change formation or too many players. Put your most experienced players on there. And train hard – but on the basics. Later, when the basics are in place, you start to put more tactical things in there. So if we plan to go to 4-4-2, the time is not know. (4-4-2 can look a bit old-fashioned nowadays, though). So I fully support AK, that he is not to change tactics now and he goes back to basics. He should not panic now and make the team even more confused. It is not rocket science. As a supporter all I can do is keep on enjoying the season. It has never been better time to support Boro than now. Never. I heard Lee Dixon say exactly the same. He said that when they were going through sticky patches they made sure they and their partners made did their jobs. Gibbo and Friend would make sure they were getting their bits right, Gibbo and fellow centre back made sure they were in sync. The same all over the team and then things would Knit together. Do the basics right and the rest follows. Its problem solving at its finest, put everything back together to when it worked prior to the fault occurring, a reset in technical terms. Gibbo and Friend, Friend and Gibbo, Gibbo and Ayala, Yala and Gibbo, Ayala and Nsue, Nsue and Ayala, Nsue and Dimi, Dimi and Nsue, Dimi and Ayala, Ayala and Dimi, Gibbo and Dimi, Dimi and Gibbo, Friend and Dimi, Dimi and Friend. Spot the obvious problem in going back to basics. I recall about 30 years ago a Senior Exec from HQ had recommended all new equipment that was going to boost productivity and reduce throughput time in the Factory. Being the Work Study engineer I questioned the logic and validity of such claims and was basically ignored. New machinery arrives at great cost and expense, teething troubles as to be expected, a few weeks later and they are all sorted. Productivity had started to improve again but was about 15% short of where it had been prior to the new equipment being installed. Frustration started building, serious questions being asked by the board about their capital investment and no obvious savings in fact the reverse, costs had actually increased. Said Exec was hopping around shouting, pointing fingers, blaming and accusing. I was hauled over the coals by said Exec and his Boss to whom I explained that the new machinery was lovely but was never going to achieve due to other parts of the Production line limited by other factors which had nothing to do with the new Machinery and it was that area that should have been addressed first. Whilst the new machines specification were super fast on paper, due to the complexity of the product they were manufacturing it would be both physically and technically impossible to operate at that speed due to limitations on other components being assembled. The old machines were already operating at the max speed the raw materials could be processed at but the new machines had automation in some parts which removed the need for operator skill but the existing skilled operators were far quicker and slicker than the automation doing the same process. Outcome was that the new machinery looked lovely, huge investment that was wasted because of other factors that nobody took into consideration and didn’t want to hear. The longer it went on the more the frustration and blame escalated until said Exec left and half of the old machinery was reinstated to restore normal productivity. Been there myself several times on major capital projects as a manufacturing manager. Anything that needs a change of direction, transfer or converting rotary to linear movement or vice versa is a source of problems. In the early eighties as a factory manager I commissioned a major plant making roof tiles, it had been designed by our in house engineering company and cost about £8m. I had constant redesigns as I stripped out maybe half a million pounds of kit to simplify the plant, every single mod had to be justified with no help from the engineering company, many were done behind their back and ‘proved’ in real time running. They hated me. After 12 months running and just about up to speed we given a treat. We were given permission to have a look at the sister plant near Paris which ran much better than ours. Off I went with a couple my engineers. Walked in to their factory to see twice as many people as we had. No machinery guards anywhere, a chain was jumping on a sprocket so an operator cleaned it with a screw driver whilst it was running, they needed to tweak a piece of equipment so did it whilst it was running, a tile was out of the line so they just walked between the clamps and straightened it, the list goes on. Our plant was guarded and fitted with interlocks to prevent access whilst the plant was running. I spoke to my counterpart and asked some technical questions. I ran through the mods we had done only to find they had done the same several years ago. The UK engineering company knew all about them well before my plant was designed and built. My frustration was evident so the manger said, come with me. He took myself and colleagues for a lovely lunch after which his brother brought us a bottle each of premier grand cru Bordeaux. Are you advocating no machinery guards here, and working on plant while it is running? No, it was a case of selective judgement by senior management. Look how well their plant runs! Ah, what do I see? Is there not parallels to be viewed between our very own Aitor and his pursuit of the ‘crown’, King of Boroland, that no man may deny him, and our very own King Richard III, last king of the House of York? But look there, is there not treachery afield? Spoken words and deeds mistrustful, loyalty questionable? Take care King Aitor for the crown wobbles ever so slightly upon your proud head, many are wishing your reign be dead. Frequent ye not the field at Bosworth. I’m wondering whether we might ever run out of first division managers. Given the modern day media-fuelled demand for immediate impact and success, and managers coming under pressure after just a few months or games in charge, surely there must be a point at which the pool of managers that have a successful experience in the first division must diminish. So Karanka has had just over 2 months experience at this level and 8 games and the knives are out…and he’s by no means the only one to be in that position. Maybe the critics are right and the results from his experience at a lower level point to a likely failure at this level. I certainly don’t know, but just based on my own non-football experience as a manager and leader the sector seems very unusual. In my experience as a leader in the technology sector over 25 years, I’d say 3 years is a minimum period a new manager/leader might need to effect change and therefore be assessed as successful or a failure. Of course you could argue Karanka is closing in on 3 years, but the promotion is the equivalent of a promotion (even an internal promotion) to a more difficult and challenging job. I suppose it’s just football, and I can only say I’m happy that’s not my gig. But I do wonder about the future. Just heard on Radio Tees that apparently AK believes Negredo will start scoring. Great news although I’m not sure how that is going to happen tactically unless he has special dispensation from the FA to kit Negredo out in a Hi-Vis vest so his team mates can find him? The first knives came out the day Mogga lost his job before we had even heard of Karanka. More came out when we realised he was Spanish, a veritable clatter when the links to Jose became known. Yet more when had the run of not scoring, clinking became evident when Meijas was in goal. Play off defeat brought a rattle. AlbertGate brought a surge in Viners profits, Charltongate had Sheffield refurbishing mothballed premises. Promotion by a whisker heralded a rattling. The poor fayre and just above the relegation spot has the sharpeners busy again. That is the way of football management, unless you are really good and fortunate the manager loses support as time passes. Some lose it quicker than others, the charge sheet grows, it certainly isn’t a career for life. Big game this weekend lads, traditionally one where we either get a shellacking or battle to a heads-held-high draw or little or no action. I think Woodgate still has some Henry crumbs in his pocket from the game years back. This time around we’ve got to deal with the Mercurial Mesut and the Slippery Sanchez, plus Freud’s new disciple, Theo Walcott, who attributes his new found scoring prowess to taming his Id. So, challenges all over the pitch, and lots of fires to put out. I am more than slightly concerned about seeing Walcott running at (or behind) George, and Barragan having to try and work out which direction Sanchez scurried off into, but we all know that with Arsenal, you can rattle them. That’s why I’d bring back Clayton alongside De Roon and probably move Forshaw up to number 10. Defensive, yes, but hopefully with enough tackles in them to rattle Ozil and co and allow us to get a foothold. In attack it must be Traore out right, please please, as we need an outlet. I’d probably opt for Rhodes over Negredo for the same reason, as despite Negredo’s obvious ability to bully, I suspect we will have more opportunities getting in behind rather than in front of the defence. First big test of the season, let’s hope that we rise to the challenge. It’s a MUST win Smoggy! I would say that its not so much of a “Must Win” but more of a “Nothing to lose so give yourself a chance” kind of game. AK could of course go 442 and blame the fans or he could throw castaway and half fit Dimi in and then say “see what happens” when we get beat by 3 or 4 goals (hopefully not more than that) stuffing our GD margin into the bargain thus bigging up Victor. He may of course surprise Arsenal by playing further up the pitch, engaging with Negredo and relying on our diminutive super sweeper keeper to show the world that he is still número uno. He may rely on the blistering pace of Barragan to get down the flanks feeding Stuani to dribble past three defenders and into the box. Swansea nearly nicked something at the Emirates by having a go but I doubt having a go will happen. Sitting deep, Barragan will get skinned for pace and likely booked in equal measure, Stuani once again will not pick up an overlapping full back and a delicate chip into the top corner will leave our commanding keeper asking why can’t they keep it on the ground so he can sweep up instead of having to use his hands all the time. Afterwards it will be because we are not in their league and we need to concentrate on our mini league against the likes of Watford, West Ham, Sunderland, Palace and Stoke where we can inflict damaging draws. So long as Ben has a decent game in front of the reported scouts is probably the best result we can hope for then we may get a few quid off Chelsea in January so we can waste the lot on some more Spanish and South American imports with little to no experience of the English game to then be told but we don’t see them in training! Almost forget, put a daft tenner on Rhodes coming on in the 86th minute and 3-0 down. Nothing to lose game, I hope AK does give it a go, points from unexpected places and all that. If only we could play these teams in training at Rockcliffe where our players are apparently really impressive. U haven’t factored in the possibility of an injury or a red card or two. What abouts the advices of other posters here? Are they not entitled to suggest that we play our most experienced players and go back to Maggie’s ‘basics’? Surely that’s the ticket? Means we won’t see any fast wing play mind, but hey, Aitor has been soooo successful recently without it. And don’t forget, Aitor is not for turning, his style and formation are the right ones and any Einsteins can go take a running pfftt! I hope we play with some tempo. When we do that we stand a chance of at least giving Arsenal something to think about. If we are ponderous they will cut us to shreds, if we go 442 we will be cut to shreds because we will be outnumbered in midfield. Seeing as we’ve setup to defend against ‘the likes of’ West Brom, Sunl’nd, Stoke etc, I don’t see much point arguing how we’re going to setup against a team that, on it’s day, would frighten any team in the world up front. When they fancy it, Arsenal are surely the most dynamic and entertaining attacking team the Prem has ever known. I fully expect we’ll set-up to defend within an inch of our lives. Whether it works or not is clearly up for grabs. Our very best defensive performance right now probably wouldn’t prevent even an Arsenal from scoring, and I don’t see where our goals are ever going to come from. That said, throwing a total experiment at the Emirates would be a recipe for disaster. I do agree 100% it’s about application, intensity, tempo and concentration. If we do that, even if we get beaten, we may just start to get our mojo back. We want to see them put up a fight. Playing defensively isn’t necessarily a bad thing. It certainly isn’t evil and it doesn’t make AK a bad person or an eejit. It’s how he thinks on balance the team has the best chance of surviving it’s first season in the Prem. Will it work? Jury’s out, but it always was. Finishing 16th would be a great achievement for some, whilst for others it will be seen as about 60 dropped points. There you have it, I wonder if he kept a straight face? A dedication to Aitor afore the Emirates clash of footballing titans (I believe both are still in the same league, although there are many who would try to convince us otherwise). Boro put on their best display of the season and are unlucky not to come away with a point. Am I right in thinking this will be the first outing for the blue strip since Sunlun? Hopefully it will become a lucky kit for us. I really hope the quote attributed to AK in the star is fabricated. The motivational guru that is AK. If I was Jordan Rhodes I think I’d just get my kitbag and go home! Even if I believed it is never publically say it. Guess we’re just relying on one striker to do the business this season. Reckon it’ll be 2-0 to arsenal tomorrow. Think we’ll make it tough for them in terms of chances created and we’ll battle valiantly but a goal scored in each half for them. Can’t really see us threatening their goal. And if we do strike early think it’ll be similar to the Everton game.